We are the kind of people that do. We do electronics repairs and participate in the smart homes revolution. We are the kind of handymen that caters to smart devices, from smartphones, to computers and the AI driven technologies that are behind things like the Echo. Indeed, we pride ourselves on being able to perform a wide variety of electronics work, and so we are Hi-Technology. Hence, our namesake - HiTech Handymen. 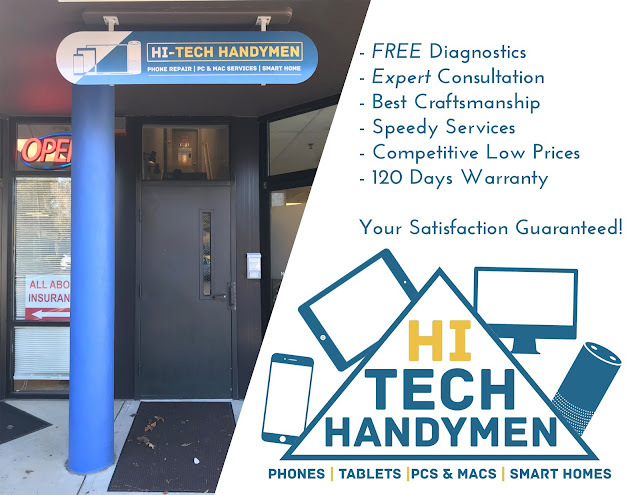 We are different from most cell phone repair shops; we are dedicated to providing only the best customer experience at very affordable price. We are community driven, we actively listen to our customers and we want to help restore your devices back to the way it was designed to run. Our mission is simple; provide quality repair service at affordable prices. Most iPhone Repairs are done in under 30 minutes or less. That's fast service. We meticulously perform our repairs with extra time to ensure no problems arise with your repairs. After all, we stand by our competitive, 120 Days warranty to give you the peace of mind when do a repair with us. We stand 100% by the quality of our repairs. Our technicians have been in this industry for a long time, having been trained and tested at a variety of establishments, before opening up HiTech Handymen. Our computer services are all priced competitively so that you can be up and running for less than competing stores. We are the first in the Chapel Hill area to implement Smart Home services, so that you can setup your Smart Home with ease. We've got your back!